There I was giving my 1.50 minute pitch about Beyond Blood in front of 50 plus librarians. The scene was the Metro Convention Centre in downtown Toronto, Canada last Friday afternoon. The event was the Ontario Library Association’s annual conference. Twenty-two of us crime writers from Crime Writers of Canada were individually doing our version of crime speed dating/pitching. It was interesting to see and hear the various pitches, especially if like me you were about two-thirds down in the presentation list. We huddled together behind and to the side of the small stage, waiting and watching and hoping. The idea was to interest these librarians from various Ontario library branches to order our books for their libraries. Although it could be a blur of 22 authors, the librarians did have loot bags with our book and author info. Mine was the book mark for Beyond Blood. Afterwards I decided to tour around the exhibitors’ booths. Surprisingly there were no library branches with booths – just services that libraries could use –digital and otherwise. On a whim I started talking to a few of the exhibitors, asking them questions about what their business does and mentioning the pitch we crime writers were doing. And got a big surprise. Some of these exhibitors are big crime and mystery readers, including one from Scott’s Directories who loads her e-reader with mystery fiction books. So, I did a pitch for Beyond Blood and handed out my business card. 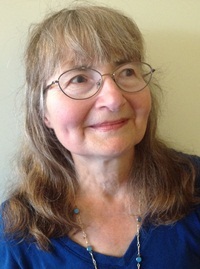 A bit later, over a cup of tea, I chatted with another fiction crime writer, Madeleine Harris-Callway, author of Windigo Fire and one of the featured authors in the Mesdames of Mayhem Thirteen anthology http://mesdamesofmayhem.com/about/madeleine-harris-callway/. Madeleine and I bemoaned the difficulty of getting book reviews. But that is a subject for another post. All in a half-day’s book promo, but it had a twist on the usual for attending trade shows and conventions. I’ll leave you with this link to get more tips on book promotion. Author of the Beyond book series. See www.samcraw.com and www.bluedenimpress.com for more info. Book at top of post links to my amazon author profile.